Height 177 cm, width 187 cm. Rome, Roman National MuseumInv. No. 124506. Height 177 cm, width 187 cm. The fresco panel was found in Rome in an embrasure near the Baptistery of San Giovanni in Laterano; transferred to Palazzo Barberini in 1655, it was given to Italy in 1935 by the princess Barberini. The fresco panel was found in Rome in an embrasure near the Baptistery of San Giovanni in Laterano; transferred to Palazzo Barberini in 1655, it was given to Italy in 1935 by the princess Barberini. 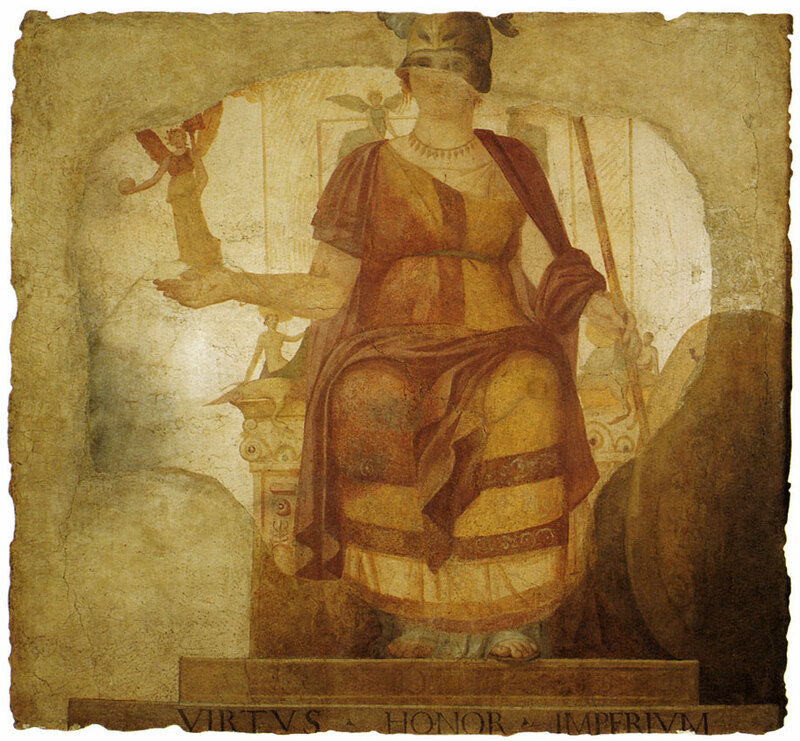 Various reintegrations in oil (the top half of the head, almost all of the shield, the feet and plinth, the base with the inscription VIRTUS — HONOR — IMPERIUM and the lower part of the sides of the throne); later overpainting is visible in various spots. Ht. 177 cm, W. 187 cm; inv. 124506. The imposing figure, seated in a frontal position, is wearing a white tunic, a gold colobium with purple and gold-filigree stripes and a purple mantle, and adorned with a necklace with pendants and pendant earrings. Her left arm grasps a spear which is partially covered by a shield posed on the ground, and her right arm holds a small statue of a winged Victory with a globe and standard. Images of Eros and Psyche are still conserved on her shoulder, both of them quite small and with wings, and two other such figures, a seminude female and a male, are visible on the arms of the majestic throne, seated on swans whose long necks hang over the edge. The work can be dated to the period of Constantine by virtue of the classical rigor of the composition and because of the similarities to the frescoes in the imperial palace in Trier. This dating helps to properly assess the iconography; the figure, in fact, has often been identified as the goddess Rome, especially because of the arbitrary seventeenth-century addition of the helmet, but her jewelry and the presence of Eros and Psyche (possibly together with Jacinthus and Aura) are indicative, rather, of the image of Venus — a reading first proposed by Winckelmann. If this is indeed the case, the figure might be a pictorial representation of the cult statue in the temple of Venus and Rome on the Velia dedicated by Hadrian and restructured by Maxentius in AD 307. This hypothesis is supported by a painting discovered in the 1960s in the ruins of a late imperial domus south of the Baptistery of San Giovanni in Laterano (identified doubtfully as the domus Faustae), whose large composition depicts sea creatures and a series of individuals who might be members of the imperial family. Lexicon Iconographicum Mythologiae Classicae, Zürich-Münich, VIII (1997), p. 1058, no. 136, s. v. Roma (E. Di Filippo Balestrazzi); Romana Pictura. La pittura romana dalle origini all’età bizantina, A. Donati ed., Catalog of the exhibition (Rimini, March-August, 1998), Milan, 1998, pp. 291—292, no. 66 (M. Sapelli). © 2005. Museo Nazionale Romano. Palazzo Massimo alle Terme. English Edition. Edited by Adriano La Regina. Electa, 2005 (First Edition 1998), pp. 252—253.